That Subaru owners love their cars is no secret, the marque has won the annual Top Gear/JD Power customer satisfaction survey for the last two years running. 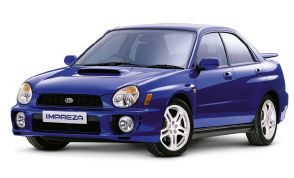 The highly acclaimed Impreza has recently undergone a major revamp but how do you improve on something which was near perfection in the first place? 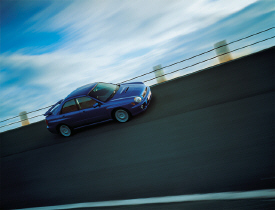 The original Impreza Turbo was known as the ''people's Ferrari'' and with good reason. The explosive acceleration allied to huge traction over any sort of road surface meant that the boxy Japanese saloon/sportswagon could easily ruffle the feathers of performance cars costing two or three times as much. Subaru have given their new Impreza a muscular look with its purposeful, angular body but in trying to make it more refined have they also made it a bit soft? I spent a few days piloting the demonstrator at Fiskens in Forfar in a bid to find out. When I first saw the photographs of the new Impreza I wasn't convinced by the front nose treatment but it looks much better in the flesh and it definitely grows on you. The hot Subaru was never all about appearances anyway, it was about performance and the new model drops a less than subtle hint with the letters WRX stuck on its backside. Rally fans will immediately be aware of the connotations here but for those who aren't WRX is how Subaru badge their World Rally Championship contender cars. Rally heritage has played a big part in the development of the Impreza and this is quite apparent when you get behind the wheel. With its sophisticated full-time four-wheel-drive system, the car is beautifully balanced, the steering is nicely weighted and very direct. The whole package inspires confidence and the level of available performance makes overtaking a very swift and safe affair. The facts and figures speak for themselves - 218 PS at 5,600 rpm and a whopping 292 Nm of torque at a lowly 3,600 rpm. That's enough oomph to enable a top speed of 143 mph and a 0-60 dash of 5.9 seconds but more impressive is the way the Impreza delivers this power to the road. Suspension is firm, sure, but the Impreza is endowed with a poise and fluidity through the bends that more than compensates for the hard ride. The car propelled me effortlessly up the Devil's Elbow towards a snow-covered Glenshee ski resort at a speed bordering on the naughty without the need to shift down from fifth gear. The trusty two litre boxer engine doesn't bark quite as loudly in the WRX but that's because Subaru have tried to refine their new model. The old Impreza turbo was a brute which would sit and rock menacingly on its chassis on tickover. I loved the noise of the old car and missed its lumpy growl and squealing turbo to begin with. New owners will perhaps prefer the more muted rumble from beneath the traditional scooped bonnet which will allow better enjoyment of the now standard CD player. Standard equipment also includes air conditioning, 17-inch alloy wheels and huge 16-inch front and 15-inch rear ventilated disc brakes with ABS. For a performance car, the Impreza is a surprisingly practical choice. Even in four door guise the cabin is plenty roomy and there's a large boot for the camping and climbing equipment. The 5-door sportwagen will be the obvious choice for the dog owners though. Despite boasting sophisticated full-time four-wheel-drive, the Impreza is not a machine you should attempt to take off road. Sure, the traction is there but the front spoiler won't be if you're not careful! Improvements to the design and finish of the interior and better soundproofing have brought the new Impreza forward, it's still excellent value and no, it's definitely not gone soft.